﻿ 5 AI Chatbots User Adoption Challenges and How to Overcome Them? While the conception of mobile applications was in the nascent stages, people were already familiar with browsing the internet via a web browser. It took a long time for the developers to convince the public to use the apps. People realized that using apps is a better way of accessing the internet. The same is the case with the AI chatbots. There is a fear that artificial intelligence is going to learn something new every day. People think that will soon conquer the earth and rule over humanity. This has caused quite a lot of problems in the popularization of the AI chatbots. This is so because people are outright refusing to adopt the technology. They fear a future that has its base in sci-fi movies. But, are not looking at the benefits to humanity in case they adopt the chatbots. As per a recent survey, 43% of respondents prefer dealing with humans instead of AI chatbots. This has become a significant cause of inconvenience for any chatbot development company since they spent quite a lot of time and money into the making of AI chatbots. The pain rose a few levels when no crowds were lining up to use the chatbot after it went live. While the expectations were entirely different, the result ended in a pain-inducing circumstance. There are quite a lot of different challenges that need handling. In a survey, almost 30% of the respondents said that they fear that the chatbot would make a mistake. As discussed above, the chatbot technology has not seen mass adoption. It proves that the technology works is still circumstantial. The same was the case with the mobile app development a decade ago. People were not ready to adopt the new change and were comfortable in how they were set. Humans are creatures of habit, and the current habit is the status quo and not the chatbots. Getting them to the other side of the spectrum is not an easy task. You will have to cross quite several hurdles before they start to adopt the chatbots. There is nothing that you can do to change the perspective of the users. You will have to understand that you are in it for the long run. There will come a time when everyone will be ready to accept the technology. There are no short-term goals when it comes to introducing new technology to the world. All you can do is be patient. Ensure that your AI sales chatbot can leave a lasting impression on the users that happen to use the chatbot. This will help you establish an image of providing features that the status quo is unable to do. Many sci-fi movies have made use of artificial intelligence. Making it hard to meet the expectations of the users worldwide. Users have an image in their minds that chatbots will be as smart as the humans. They believe that they will serve as their human assistants. The fact remains that the humans will always be smarter than the AI chatbots. Albeit the chances of making an error will be quite lower in the chatbots. The only thing that you can do in this regard is not oversold your chatbot. Advertise the features that you are sure of. Do not make any promises of future integration of a feature that is quite impossible at this moment. Hopefully, in future, you will come up with an algorithm that will be able to surpass the barrier. Then you can emerge as the innovative machine learning company in India. You will be able to provide a feature that was once considered impossible. This is quite a common problem. The technology is new. Every organization is trying to integrate the chatbots whether with their public dealing or for the internal use. The problem arises when the integration of chatbots with the existing technologies is difficult. These companies then complain about the problem to the customer care bot development companies. Thus, leading to long conversations that are one-sided. It does not matter if you represent the chatbot development services as an external company or a stakeholder within the company that integrates the AI Chatbots for its employees. All that matters is that you have done your due diligence before recommending the use of a chatbot within the company. Have a look at the existing technologies within the company and ask yourself if the bot will work in synergy with them. Quantify the increase in productivity of the company as a result of the integration of the chatbot. Ask around if the employees of the company will be comfortable with the use of a chatbot. Predict a return of investment on the chatbot. If you are unable to do any of the above, the company in question may not be your potential client. You can never know how the users will react to the chatbots in their lives. You can have the best-designed custom erp/crm chatbots, and the users may not think about it twice. There is always uncertainty when you are introducing new technology to the users. Collect data and study the responses that people have to your chatbot. Improve on the points that are important and try to have a response that will keep the user engaged. With the various movies that have instilled a fear of artificial intelligence, there is a fear in the people that the chatbots will be the first step in the machines taking over the world. This has caused quite a negative impact on the chatbot adoption. Like discussed earlier, there is nothing that you can do about it except wait for the people to come around. Promote the bot as a real entity and try to improve the image of artificial intelligence. 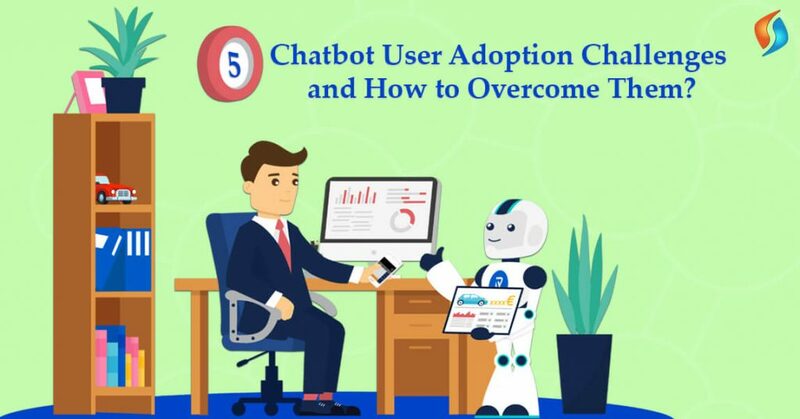 This way you can overcome the chatbot user adoption challenges. If you are looking for Chatbot development services for your business? Then your search ends with Signity Solutions. We are one of the most experienced chatbot development solutions provider in India. We have been helping our global clients with their chatbot requirements. Hire our outsourcing team of best chatbot developers and enjoy the benefits of seamless integration of chatbot technology with your business. Contact us now.